I checked the intermittent creek bed for deep holes still holding water and maybe a few ducks. Three fat October mallards tipped up-and-down in the shallows, oblivious to my presence. I surveyed the terrain carefully and planned to close to 20 yards before looking over the bank. The two big greenheads were my target. I crouched and tiptoed to where I'd last seen the birds and stopped for a second to focus, knowing the action would be fast. I rushed the edge of the creek bank and the ducks froze for a second, stunned and surprised by my presence, before leaping into the air with strong, deep wing beats. They were 15 yards off the water by the time I shouldered my gun. A bird collapsed and fell to the prairie. I swung hard on the second drake and fired, missing low. My third was on target and crumpled the greenhead. I was a young hunter then and that thrilling moment hooked me on duck hunting. Puddle jumping was practically the only way I could go out on my own when visiting relatives at their farm. I jumped lots of potholes and water channels as a kid. It is a standard practice in many areas of Canada where some hunters don't even own decoys, as the jump shooting can often be very productive. Most of us seasoned waterfowlers dream of shooting a drake canvasback as it comes whistling into our layout boat, or a mallard with three curls in his tail feathers splaying out bright orange feet in the field. 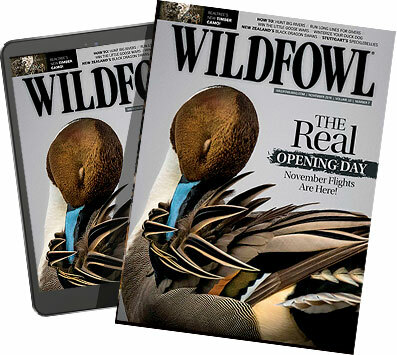 Truth be known, we developed our appreciation and value for waterfowl over many years. When most of us started out, we mainly focused on the body count. For many young, inexperienced hunters getting up early to decoy morning flights isn't as attractive as sleeping in and still shooting their limit. Many landowners and hunters in Canada's farm country feel strongly about not killing ducks or geese over water. They believe if you leave the birds alone, and give them the sanctuary of their favorite roost, they will stay around longer. When birds are pressured in the fields and on water, they simply migrate south to get away from the pressure. In regions with significant amounts of hunting in agricultural fields, you will find it difficult to get permission to hunt the water. Anyone planning to hunt a wetland should make sure to ask landowners specifically about hunting water to avoid misunderstandings. There are areas and specific times of the year when jump shooting can be productive and not affect birds in large numbers. For example, many quarter sections of land in the prairie and parkland regions have densities of 20 wetlands or more. With so many potholes in a half-mile of land, there's plenty of birds scattered on the different basins. In irrigation country there are long, deep ditches that will hold birds throughout the fall. You can actually use a spotting scope to check out the linear wetlands, which can run for miles without a bend. Dugouts in cattle pastures can be dynamite and borrow pits along the highways, where clay was extracted to build the roadbeds are sometimes incredible. These smaller basins only hold a handful of birds, so they're perfect for jump shooting. There could be a couple teal and gadwall on one and a few mallards and wigeon on the next. It is extremely rare to catch geese on the smaller wetlands or irrigation channels, but when you do it will be a small family unit. In other words, you won't be messing up someone's field shoot by bumping birds out of their routine. Jump shooting allows you to shoot a mixed bag or a limit of big greenheads. It is a great confidence-builder for young shooters who enjoy the stalk as much as they do the shooting. There are hunters who are against jump shooting, and like anything, it is a personal preference. I know lots of duck hunters who only shoot over water to get the most out of their dogs. Others only hunt agricultural fields. Some enjoy flushing and shooting ducks with their kids. Does jump shooting have a place? I think so. I hunt with several young men. They have all the gear for hunting water and fields and spend thousands of dollars on gas spotting shoots and watching birds every night of the week. They are addicted to what most of us crave and want from a hunt, but almost all of them started by jumping ducks on local ponds. Canada may be one of the few places left with enough open spaces, access to land, and opportunity to allow hunters the chance to jump shoot. If you want to hook somebody on the sport perhaps a stalk might make them ask to join the next day's field shoot. Then, it's only a matter of time before they start to admire their quarry and appreciate the rewards of a good hunt.